What’s your Game Plan for Thanksgiving? Thanksgiving celebrations differ from one home to the next. Still there are certain flavors, traditions and approaches connected with our most food focused holiday that strikes a chord in all of us. Whether you go with the traditional turkey with sage and onion stuffing, giblet gravy, candied yams, and cranberry sauce; put a cultural twist on it, with a chipotle rubbed bird, red chili gravy and cornbread chorizo stuffing; or go the vegan route with a mound of riced potatoes shaped like a bird and glazed with browned butter with all those wonderful vegetable side dishes, Thanksgiving is a dinner you can sink your teeth into. But what to drink with it has been debated for many decades. Every Turkey Day, the family sommelier faces the perplexing question: do I go with something sweet that can stand up to candied yams and tart cranberry sauce and keep Mom happy? Or go with Beaujolais Nouveau because it’s available now, red and fruity? Decisions, decisions. Thanksgiving wines shouldn’t be intimidating. This is not the time to pull out that bottle you’ve been cellaring for a while. Serve something familiar, homey and delicious enough for those neophytes to be satisfied and thoughtful enough for wine lovers to appreciate. Pairing wine with roasted, brined or deep fried turkey is a piece of cake but short of a dessert wine, nothing is sweet enough to do battle with yams blanketed with toasted marshmallows. Dry, high alcohol wines will perish with all that sugar and salt. And white wines need a decent amount of acidity to cleanse your palate. Uncomplicated, fruity wines with a little residual sugar are the best recourse for matching with these courses. Some of the better partners for Thanksgiving dinner, in my opinion, are Alsatian whites, German Rieslings, Grenache blends from France or Spain and Tempranillo from Spain or the West Coast. Pinot Noir, contrary to some opinions, has never worked for me with all those strong flavors dished up at Thanksgiving- unless, of course, it’s in the bubbly. Balance is the key for the perfect pairing. For a white, think Riesling or one of those soft, slightly sweet Pinot Gris. For reds, fruity and friendly, low alcohol Zinfandels, Tempranillo or even Carmenere would work well. Every holiday dinner should begin with something celebratory and good. At my table, nothing says celebrate better than a bottle of bubbly. The pop of the cork signals the start of the celebration. And it’s off to the races from there. Given the tradition of the day, here are some American bubblies with good acidity and a core of fruit to consider: Chateau Ste. Michelle’s extra dry which is actually slightly sweeter in style than a brut despite its description; Oregon’s Argyle brut or Washington’s Treveri Cellars would grace any table. Treveri produces several Columbia Valley sparkling wines you should try. Three that would be perfect for this occasion would be their sparkling Riesling, Gewurztraminer or Syrah. You will be impressed! These sparklers range in price from $10.49 to $23. White wines to serve, could be California’s Oak Grove Pinot Grigio which is soft, fruity with crisp citrus flavors. Or Wine by Joe Pinot Gris from Oregon that has wonderful flavors of citrus, pear, and green apple with refreshing acidity. Both are under $10, so stock up for the holidays. But Riesling is really the best white to serve. And Washington makes second best – after Germany, of course. Pacific Rim Riesling from Columbia Valley is a delicious off dry, richly fruity wine packed with peach, apricot flavors with a hint of wet stone. Milbrandt Riesling scored high with its fresh, lively stone fruit flavors and juicy acidity. These guys have been growing from in the Columbia Valley for generations. Latah Creek Columbia Valley Riesling is filled with flavors of green apple, ripe pear and spice with a crisp finish. Jones of Washington Columbia Valley Riesling is an orange blossom special touched with pineapple and fresh picked apples. He also makes an estate Pinot Gris from the Ancient Lakes AVA that would perk a lot of interest at the table. Two Mountain Winery Rattlesnake Hills Riesling is another crisp refreshing wine with a nice balance of pear, citrus, and minerals on the palate. Red wines are trickier than white but if you make sure the alcohol is around 13% or less and there is a modicum of fruit, your chosen one will be a hit. With that in mind here are a few grape suggestions: Lemberger, Tempranillo and Baco Noir. Lemberger, a dark-skinned grape from Austria, is typically fruity with ripe plum and black cherry and a hint of pepper. It does well in colder climates where it goes by a more mellifluous name of Blaufränkisch. Look for Kiona Vineyards and Winery on Red Mountain, the largest grower of Lemberger in the United States. Others include Alexandria Nicole Cellars, FairWinds Winery, Kana Winery Olympic Cellars, and Whidbey Island Winery. Priced between $10 and $22. I had hoped to recommend another grape of Spanish origin from Washington and California that would be fabulous with dinner, but they all went past the affordable for a big dinner party price. So I’m taking you to Spain for delicious, affordable and the perfect reds for Thanksgiving. The best made and priced would be the Campo de Borja Borsao Red from La Mancha, Spain. With its intense, smoky, black cherry and spicy flavors, this wine is a blend of mostly Grenache and a dollop of Tempranillo this wine is a deep ruby/purple color. From Valencia, the El Prado Red is another blend this time Tempranillo and Cabernet. It’s a medium bodied with raspberry and current flavors. And from Rioja, with 100% Tempranillo is the Cune Rioja Crianza. The toasty, cherry flavors are smooth and satisfying. Also from Spain but made in Prosser is the Red Diamond Temperamental. Red Diamond sources grapes from the best locations around the world. This Spanish blend offers flavors of berries and plum has a silky smooth finish. Garnacha de Fuego Old Vines from Calatayud is another intensely flavored wine that emphasizes fruit. Mostly black cherry but there are plum and raspberry with smooth tannins and a long finish. The best thing about these wines is the price – all under $10 and most around $7. So, stock up on these affordable wines, because there are more holiday dinners in your immediate future. 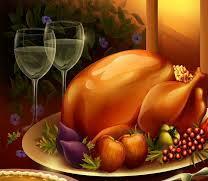 Have a warm and happy Thanksgiving. 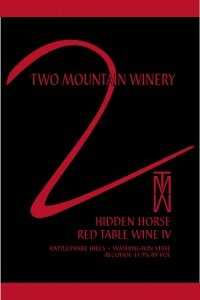 At the first Taste Washington event we went to a couple years ago, Mary and I stopped at the Two Mountain Winery table. Mary knew one of the brothers who founded the winery from her days at the wine shop, so we had a great time chatting with him about the winery and upcoming releases. My editor had also brought the winery to my attention, telling me she really enjoyed the Riesling Two Mountain produces. So when I was at the grocery store the other day and saw a Two Mountain red blend, I decided it was time to give them a try. The blend is the winery’s Hidden Horse Red Table Wine VIII, which is a Bordeaux blend. The bottle doesn’t give a breakdown of the grapes used, but the finish sang of Cabernet Sauvignon, leaving me to believe that was the dominate grape varietal. A red blend for the ages. This is a great red for almost anytime. Thirty-nine percent Cabernet Sauvignon, 37 percent Merlot, 15 percent Cabernet Franc, 6 percent Syrah, and 3 percent Malbec has created a great combination of elegance, structure, approachability. With wafts of boysenberry, blackberry, and a hint of white pepper then working into a mouth containing dark rich plum, over ripe bramble berries, sweet spice, and rich tobacco leaves. What a gem! I’m guessing the break down of grape percentages is relatively similar, although maybe no Syrah in the Hidden Horse VIII blend — I didn’t catch any of the jammy notes that could come with Syrah. This was a great every day red wine and paired well with the potato soup I made from a combination of russet and Yukon gold potatoes and roasted cauliflower florets. The wine retails between $15 and $20. I think we bought it closer to the $15 mark. 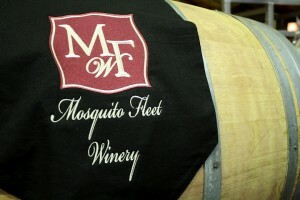 This Washington winery is a nine-year-old family-owned operation nestled in the Rattlesnake Hills of the Yakima Valley. Two brothers, Matthew and Patrick Rawn, own and operate the winery and estate vineyard. The Vinho Vermelho (Portuguese for red wine) is made from one of the six grapes that are native to, and allowed in, Portuguese Porto. Winemaker Matt Rawn aged the wine in American oak for more than two years. 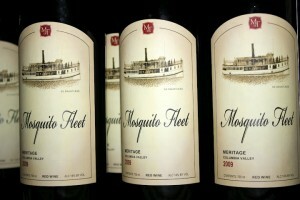 Most American wineries make port from grapes such as Cabernet, Syrah and Zinfandel. In the U.S., very little acreage is planted to the noble Touriga Nacional grape. The “deep” is a term hard to wrap the brain around, especially when describing smoke. The Two Mountain Winery 2005 Yakima Valley Vinho Vermelho is listed at $47.